Recently, I learned that Shaowen Bardzell had proposed a notion of feminist HCI. I wondered if feminist HCI was connected to values-rich interpretations of interaction design, and if there were implications for sustainability in the context of interaction design. Feminism is long associated with environmentalism as a matter of environmental ethicsin particular as a potential counterpoint to “dualistic and hierarchical modes of thinking” that set humankind in opposition to nature . What follows is the conversation Bardzell and I had with respect to feminist HCI and sustainability. Eli Blevis: Shaowen, can you describe feminist HCI? Shaowen Bardzell: Of course! Feminism is not always well understood, especially in politics and the media. People sadly identify it with man-bashing and worse. Yet it is a well-established intellectual tradition, with its own body of theory and applications throughout academia and industry, particularly in traditional design fields, such as industrial design, fashion, and architecture. One might identify feminism’s central tenets as commitments to agency, fulfillment, identity, equality, empowerment, and social justice. I think these commitments make feminism a natural ally to interaction design. As computers increasingly become a part of everyday life, feminism is poised to help us understand how gender identities and relations shape both the use and design of interactive technologiesand how things could be otherwise, through design. By “feminist HCI,” I mean the integration of feminist perspectives as a resource for HCI, much like it has been in the past for traditional design . On the one hand, feminism can be used as a critical strategy to analyze designs and design processes in order to expose their unintended consequences and examine how technologies construct and/or perpetuate the gender divide. On the other hand, interaction design practitioners can also integrate feminist approaches into all stages of the design process, including user research, prototyping, and evaluation, to generate new design insights and influence the design process tangibly. I see it being applied in obvious and fruitful ways in many key areas of HCI: domestic computing, information and communication technologies for development (ICT4D), ubiquitous computing, health informatics, and of course sustainable interaction design! Eli: I read about the Hoosier cabinet in an advance copy of your paper that will appear in CHI 2010. Can you give a description of how the Hoosier cabinet assumes and presumes a place for women? Shaowen: Last summer my friend Kitch Carter introduced me to Nancy Hiller’s book, The Hoosier Cabinet in Kitchen History, and it was a fascinating read. Hiller is a cabinetmaker based in Bloomington, Indiana, and in her book, she traces the legacy of a kitchen cabinet made by the Hoosier Manufacturing Company that gained popularity in the early 20th century. The Hoosier cabinet came with a pull-out counter as a large work surface; a flour bin/sifter; and dedicated, built-in storage for various cooking utensils, supplies, pots, and pans. Throughout the early 20th century, the cabinet was marketed as the “greatest household help that womankind has ever received at the hands of science,” a design that “makes kitchen work a joy” . The Hoosier is an interesting example of a design that participated in the changing ecology of the American kitchen in that era. As a result of the rise of industrialism, household servants left domestic service to work in factories, leaving well-to-do families to tackle domestic chores on their own. The rationale behind the design of the Hoosier was to increase homemakers’ efficiency to make up for the loss of household servants. The cabinet was a success. The problem is that rather than liberating women from household work, it instead completely identified them with it. In one of the pieces of vintage promotional literature featured in the book, we see a picture of a woman holding Abraham Lincoln’s portrait in front of her Hoosier cabinet; the tagline of the advertisement reads, “I too have abolished slavery.” Ironically, the homemaker, once the mistress in the former kitchen ecology, has become a servant in the new one. More generally, we count on the notion of feminism to raise awareness about marginalized populations and to facilitate appropriate interventions in order to improve quality of life. Eli: You have talked about feminism’s potential for a new paradigm of user research in interaction design. Can you elaborate on that? Shaowen: For decades feminism has been a champion of alternative ways of thinking and knowledge production. A garage band plays the kind of music its members like to listen to. But as designers, we are taught to address user needs, not just design the sorts of things we think we would like. But that’s easier said than done. Feminism is quite good at offering us critical tools to help us be thoughtful about how we translate user needs into our own understandings and design skills. We can see what happens when we fail, as we have seen time and again with ICT4D initiatives. For example, Chavan et al. report on the failed implementation of Whirlpool’s “World Washer,” where the use of a Western-designed washing machine resulted in the destruction of Indian women’s saris, which are long and fragile garments that the washer was not designed to clean safely . The “World Washer” failure demonstrates that the design was based on a universal model of clothes washing (e.g., shape, weight, and durability. ), rather than direct contact and engagement with target user groups. It’s easy to criticize Whirlpool after the fact, but it’s much harder to know if one’s models are adequate. Feminism’s solution to this problem is to juxtapose what seems natural, universal, and obvious to a dominant social group to the experience, perspectives, and stories of marginal voiceswhether they belong to women or some other group. In that juxtaposition, there is much to learn. Eli: How can the common idea of interactivity as promoting convenience be alternatively conceived as playing a part in gender-role assumptions? Shaowen: When we conceptualize interaction designs as tools that promote convenience, we often inadvertently take a regressive decision. Of course, there is nothing wrong with making life more convenient! But, there is something wrong with us inadvertently propagating the status quo, which may include unjust social relations, simply because we aren’t thoughtful. As we saw with the Hoosier cabinet, designs can perpetuate and even create gender roles and divisions. For example, in an article that chronicles the roles that gender identity plays in the adoption and use of electricity in southern California between 1910 and 1930, James Williams attributes the successful design and promotion of small household appliances such as irons and vacuum cleaners to the alignment of existing patterns of domestic interaction and gendered division of household labor. Williams illustrates his argument with a contemporary ad in which a woman is depicted using an electric vacuum to clean the floor, while a man reads by an electric lamp and plays with an electric radio . Design historians have shown time and again that gender identity is one the key factors in the design and consumption of modern designs; surely this trend extends to interaction design. Given that different genders relate to technology differently, the challenge for any interaction designer is to balance offering design solutions that question and resist gender assumptions while connecting to consumers of different genders by appealing to their emotions, preferences, and values. Eli: How does thinking differently about gender lead to interactivity that promotes values and sustains better life? Shaowen: Comparatively speaking, more attention (positive or otherwise) has been devoted to gender-specific design in product design than in interaction design, especially in categories such as accessories (e.g., watches) and personal-care products (e.g., razors). Oftentimes, gender identity is conceptualized and conveyed through sizes, colors, shapes, and even product names. As journalist Linda Tischler rightfully points out, when product design for women intersects with “digitality,” positive user experience is often lacking, as the devices are designed by repackaging products designed for men with feminine colors and with a limited set of functionalities . This “pinking up and dumbing down” approach only aggravates the disconnect between women and technology. Employ and listen to female designers. Design is predominantly a men’s world. An increased presence of female designers who understand and appreciate women’s experiences can narrow the gap between the design team and the target user group. Focus user research on making users’ varying access to resources visibleso as to acknowledge different points of view and experiences. Look forward to Shaowen Bardzell’s paper at CHI 2010 and a longer feature article on feminist HCI that will appear in an upcoming issue of interactions. This is an exciting perspective that may lead us to new ways of thinking about sustainability in HCI and interaction design. 3. Hiller, N. The Hoosier Cabinet in Kitchen History. Bloomington, IN: Indiana University Press, 2009. 4. Chavan, A., Gorney, D., Prabhu, B., and Arora, S. “The Washing Machine that Ate My Sari: Mistakes in Cross-cultural Design.” interactions 16, 1 (2009): 2631. Shaowen Bardzell is an assistant professor of human-computer interaction design in the School of Informatics and Computing at Indiana University. She specializes in socio-cultural computing, with an emphasis on emotional, intimate, and embodied experiencesa series of research themes that contribute to the broader agenda of feminist HCI that she is developing. Her recent work has focused on intimate interactions online, designing for emotion in non-western homes, and the application of critical and cultural theories for developing concept-driven design strategies. Bardzell is co-editing a special issue on feminism and HCI for Interacting with Computers, to be published in March 2011. Eli Blevis is an associate professor of informatics in the human-computer interaction design program of the School of Informatics and Computing at Indiana University, Bloomington. 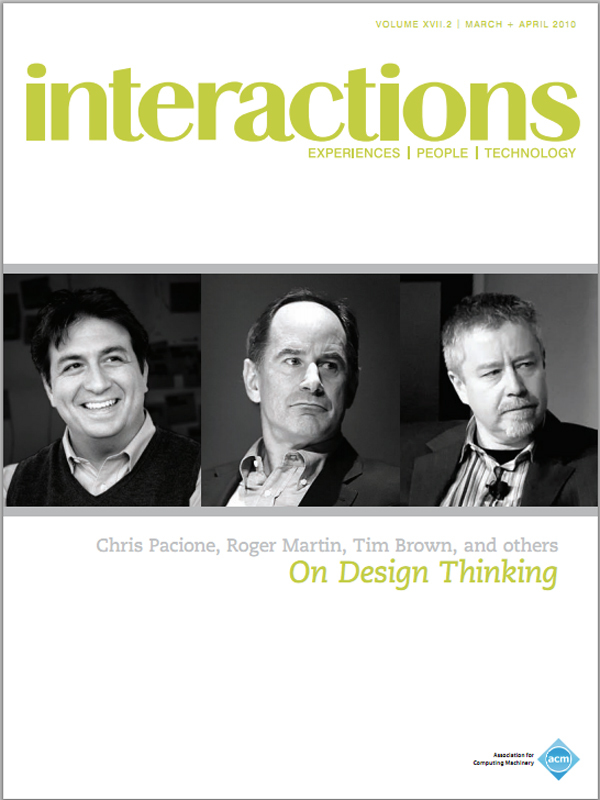 His primary area of research, and the one for which he is best known, is sustainable interaction design. This area of research and his core expertise are situated within the confluence of human computer interaction as it owes to the computing and cognitive sciences, and design as it owes to the reflection of design criticism and the practice of critical design. Blevis’ research also engages design theory, digital photography, and studio-based learning.